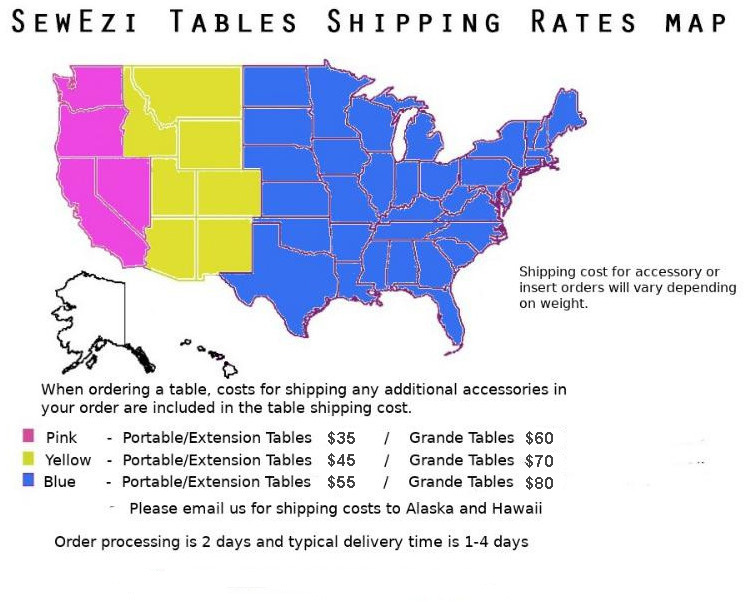 Table shipping rates include the cost of shipping all accessories ordered with the table. Accessories ordered separately from the table will have shippings rates calculated at the time of shipping. Prices and polices are subject to change without notice. Prices are included for customer convenience. Completion of an on-line order will be considered an acceptance of our policies. PLEASE INSPECT YOUR ORDER IMMEDIATELY UPON ARRIVAL. YOU ONLY HAVE 21 DAYS FROM SHIP DATE TO CLAIM SHIPPING DAMAGE WITH FEDEX. SHIP DATE IS LOCATED ON SHIPPING LABEL. PLEASE CONTACT US FOR INSTRUCTIONS ON SHIPPING DAMAGE CLAIMS. DO NOT DISPOSE OF THE BOX OR ANY PACKAGING MATERIALS UNTIL YOU HAVE INSPECTED YOUR ORDER AND ARE SATISFIED WITH THE PRODUCT YOU HAVE RECEIVED. DISPOSAL OF ORIGINAL PACKING VOIDS ANY RETURN AND REFUND. Merchandise may be returned for credit less a 20% restocking fee for all items, providing merchandise is returned boxed in its original factory carton, undamaged with packing materials, instruction manual and all included accessories. You will be charged extra for any missing or damaged items upon return. Shipping is non-refundable, and items purchased originally with Free Shipping will have standard ground shipping fees deducted from the refund total. All returns are subject to inspection before refund is given. This only applies within 30 days of ship date. Factory Defects: We will repair or replace any table within the first 30 days from ship date if we determine it is defective in material and/or workmanship and in need of repair. If the unit cannot be repaired to correct defects within 30 days of your return, we will ask the manufacturer to replace the unit or offer a comparable unit from our own stock. We have to see the unit first to determine if the problem(s) you are having are manufacturer's defects. Contact us to obtain a return label for factory defect returns. We do not accept COD returns. We do not offer any exchanges or refunds on inserts. Please contact us at 760-377-5378 or email us at barbara@seweziusa.com for further instructions on your return. In the unlikely event that your order is incorrect, missing parts, damaged or defective, please call us within 30 days and we will send you the correct product,replacement product or replacement parts. Our hours are Mon.-Fri. 9:00 am to 5:00 pm PST. All our shipping is handled through FedEx ground service. If you require a faster service, you will be responsible for the addition charges. Although we strive to maintain our inventory, we may experience a back-order status when we run out of certain products. Special orders or custom inserts can expect a delay in delivery due to production time. While we at SewEzi USA use reasonable efforts to include accurate and up-to-date information on this site, we make no warranties or representations as to its accuracy. SewEzi USA assumes no liability or responsibility for any errors or omissions in the content on this site. All information, texts, graphics, prices and links and other contents on this site are subject to change without notice.